Pula (Italian: Pola) is the largest city in Istria County, Croatia and the eighth largest city in the country. It used to be Istria’s administrative centre, but Pazin became its administrative centre in 1991 when Croatia proclaimed its independence. 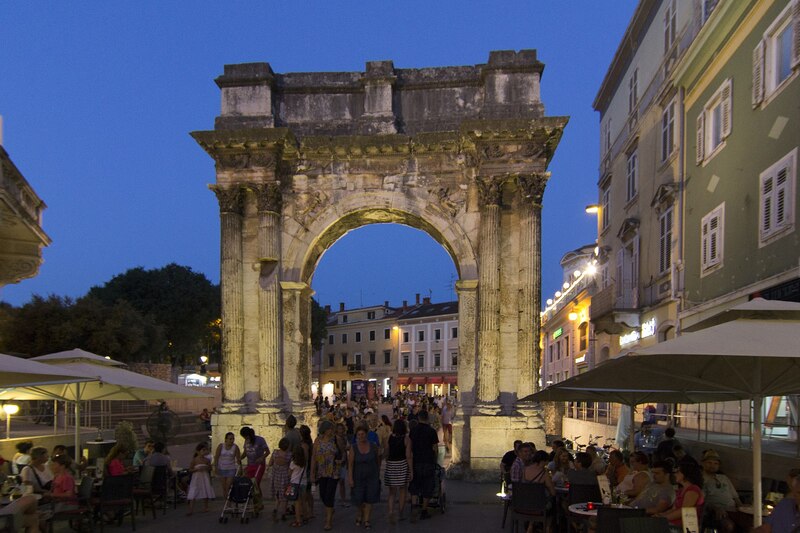 Because of its rich history, many of Pula’s residents fluently speak Italian and some other languages. In fact, Italian is recognized as an official language in Istria County although Italians make only 6% of the population. From October 1904 until March 1905, part of Pula’s population was James Joyce, who was then teaching English mainly to Austro-Hungarian naval officers stationed at the Pola (Pula) base. Besides him, Dante Alighieri had visited Pula and mentioned it in his Divine Comedy: “Sì come a Pola, presso del Carnaro, ch’Italia chiude e i suoi termini bagna” or “As Pola, along the Quarnero, that marks the end of Italy and bathes its boundaries”. Pula is most famous for its Roman amphitheatre, popularly called Pula Arena, which was built between 27 BC and 68 AD. The Pula Arena is the only remaining in the world with four side towers and with all three Roman architectural orders entirely preserved. Besides being the best preserved Roman amphitheatre in the world, it’s also the most preserved ancient monument in Croatia. The 2nd Biscuit People Conference will take place from 3rd to 6th of April, 2019 in the hotel Park Plaza Histria, Pula. The hotel is situated at the tip of the Verudela Peninsula, less than 50 meters from the beach. The ancient city of Pula is within walking distance, and it’s also close to the National Park Brijuni and Lighting Giants. A range of shops, boutiques, art galleries and dining venues are available on the lively Verudela shopping avenue, which connects the resort with the neighbouring Park Plaza Verudela Pula resort. There are direct flights to Pula international airport from Belgium (Brussels Charleoi airport) and Germany (Frankfurt Hahn, Frankfurt International, Stuttgart airports). Alternatively, it is possible to fly directly from London Stansted, UK or Valencia, Spain to nearby Trieste, Italy and go by land from there. Other nearby airports are in Rijeka, Croatia and Ljubljana, Slovenia. If these options are not convenient for you, please contact us and we will find the best solution. There are many direct bus lines from Italy to Pula, including Geneva, Milan, Verona, Bologna, Padua, Venice, and Trieste. You can also come by land directly from Slovenia (Ljubljana, Maribor) and Austria (Graz, Vienna, Salzburg).